Gareth Long - Education: The Third Teacher Blog.. I have written a number of posts about the new book 'The Third Teacher'. What is so good here is that oWp/p are not just architects who do a job and run.... they are genuinely working to research and inform all interested what they have found out, what current thought leaders are thinking and sharing what is happening around the world. 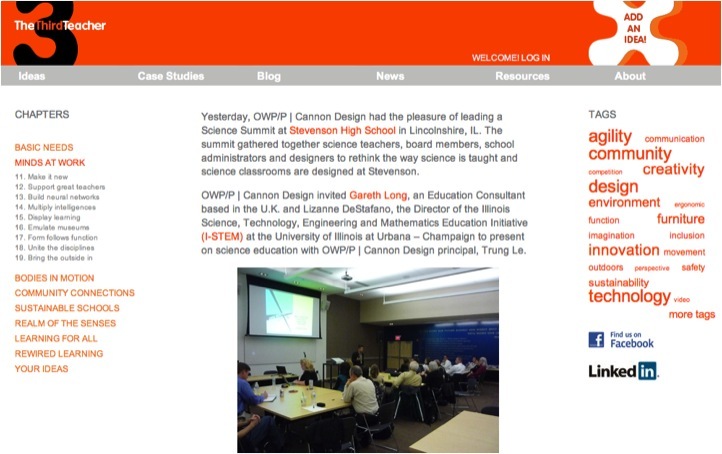 Yesterday, OWP/P Cannon Design had the pleasure of leading a Science Summit at Stevenson High School in Lincolnshire, IL. The summit gathered together science teachers, board members, school administrators and designers to rethink the way science is taught and science classrooms are designed at Stevenson. OWP/P Cannon Design invited Gareth Long, an Education Consultant based in the U.K. and Lizanne DeStafano, the Director of the Illinois Science, Technology, Engineering and Mathematics Education Initiative (I-STEM) at the University of Illinois at Urbana – Champaign to present on science education with OWP/P Cannon Design principal, Trung Le. Before the Science Summit began the OWP/P Cannon Design team and Gareth Long had the chance to tour the school. It was exciting to see Stevenson’s bright students eager to display their work and ideas as the tour group visited different classrooms. One student-teacher exchange later informed our Summit. A student asked the tour group to watch his video assignment, though his teacher replied, “Thanks for volunteering, but I don’t have your assignment.” The student's response: “Yes you do. Youtube it.” Seconds later, a Youtube search for the student’s name yielded the (highly entertaining) video for us to watch. During his presentation, Gareth Long used this exchange to emphasize that science education must be relevant to students and technologically connected. Instead of teachers policing students who forget their worksheets at home, why not accept homework via e-mail, Bluetooth, Youtube or twitter, like the teacher at Stevenson? Gareth is currently working with Balfour Beatty Capital, a multi-national construction company that is actively involved in England’s Building Schools of the Future (BSF) program, an initiative to rebuild or completely renovate all of England’s schools by 2015. Gareth shared projects from the BSF initiative that break down walls, literally, and promote connections between disciplines. For science spaces, he advocated spaces that are agile (can be changed in a minute with moveable furniture), flexible (can be changed in an afternoon with options for electricity, data, gas and water hook ups) and adaptable (can be changed over time to accommodate changes in teaching). Lizanne DeStefano spoke about her work at the University of Illinois to expand the role of science at research institutions to include a Pre-K-16 education component. I-STEM has multiple programs including partnerships with K-16 schools to promote Science, Technology, Engineering and Mathematics (STEM) outreach and support for teacher training and development in STEM. During the summit she described specific projects including collaboration with the Science Olympiad program, work with the Center for Education in Small Urban Communities to develop STEM schools and programs promoting professional development for teachers and science research experiences for students.